You should drive with the flow of traffic. Limit your speed for the next 50 miles. Speed limits are enforced for the next 50 miles. The speed limit is 50 miles per hour. 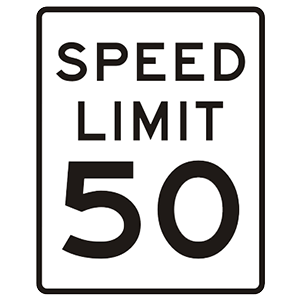 A speed limit sign indicates the maximum safe speed allowed or the minimum safe speed required. 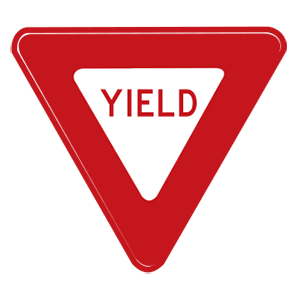 Traffic signs with three sides of equal length warn drivers to slow down when approaching an intersection and to be prepared to come to a complete stop to yield to other drivers or pedestrians. Drivers may proceed when it is safe to do so. One vehicle is behind you. Two or more vehicles form a line behind you and it’s unsafe for them to pass. Five or more vehicles form a line behind you and it’s unsafe for them to pass. The road is posted with slow-moving vehicle signs. If you are driving a slow-moving vehicle on a two-lane road where it is unsafe to pass and five or more vehicles are in a line behind you, you must pull over and stop to let them pass, if it is safe for you to do so. Slow down and look for traffic before turning. Stop, signal, then turn when safe, if no sign prohibits the turn. Signal and wait to turn until the light turns green. Wait until you have a green turn arrow before turning. At a steady red light, you may turn right provided that no posted sign prohibits it. You must come to a full stop first. Always use your turn signal before making any turn.